Size – 4.7 inches, 540×960 pixels. 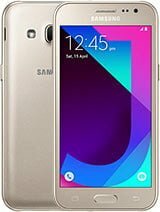 Samsung Galaxy J2 smartphone was launched in October 2017. This device comes with a 4.7 inches Super AMOLED display with a resolution of 540 pixels by 960 pixels. This device powered by Quad Core 1.3 GHz Cortex A7 processor and it comes with a 1 gigs of RAM. This device packs 32 gigs of internal memory that can be increased up to 256 gigs via microSD card. As far as this device camera was not too much pretty, the Galaxy J2 2017 packs a 5 MP camera on the back side and 2 MP front shooter for selfies. It runs latest Android OS 7.0 Nougat and is a powered by removable Li-ion 2000 mAh battery. This device is available in Bangladesh and price around 11,900/- BDT.